We were very lucky to be offered some local apple and beetroot gluts and snapped them up immediately to pickle and chutnify. La Culinari and pickle go together like beans and toast or fish and chips. When our children were little and at Potters Gate Primary School in Farnham there was an old apple tree that every year shed apples onto the school field which got used as mouldy footballs (when the lunch time supervisors weren’t looking). We thought it was such a shame to waste the apples so began an epic, annual, hysterical apple collection at the beginning of every Autumn term involving ladders and many a Chuckle Brothers moment. 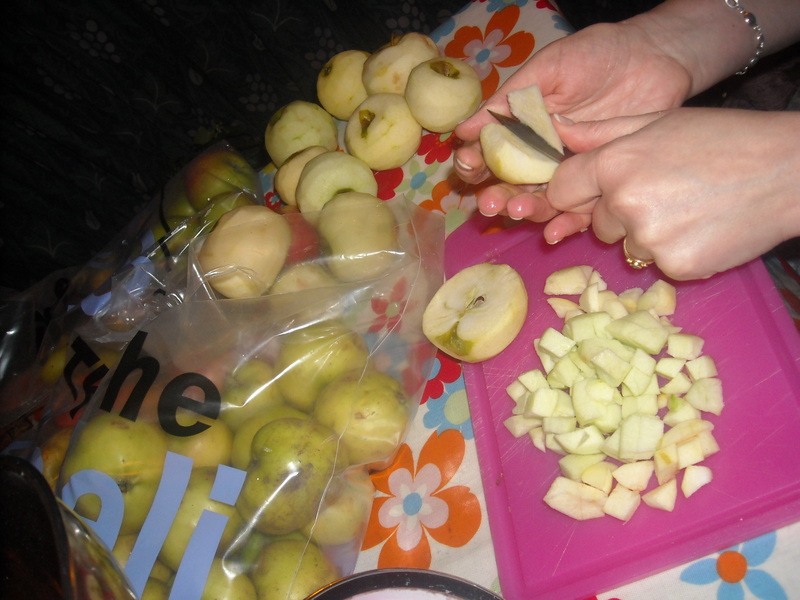 We turned the apples into Potters Pickle and sold it at the Xmas Fair to raise money for the school. Sadly, the tree is being lost to the school’s new building project but Potters Pickle lives on! Just peel and chop the apples, onion and chillies and bung in a big pan with everything else and cook for about an hour til the fruit is soft. Taste and see if it needs more spices or chillies when it’s about half way through cooking. Spoon into clean, warm jars and according to Hugh F-W via Mandy you should invert the jars and leave to cool upside down which seals them. I’ve never heard this before and have just spent tooooo long googling this and cannot find out the definitive answer, any ideas anyone? As before, just chop peel and chop the onions, beetroot, chillies and apples. Chop the stem ginger. 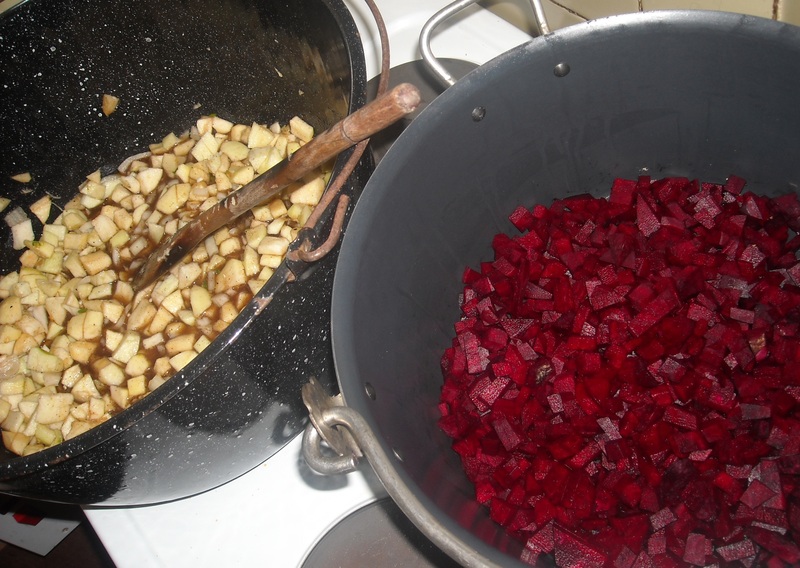 Put everything in a big pan and simmer away til the beetroot is soft and tender. Spoon into warm jars and seal. The best thing about this chutney (apart from the earthy, sweet and sour taste) is the zingy bright pink colour. Both chutneys had a fair chilli kick which we liked. The chillies we used were hot ones from a mixed box from the South Devon Chilli Farm – an ace birthday present from my brother @hippyjon We also got to christen another present from my other sibling @fabiapol – my jam funnel, sounds rude but it’s NOT. Very practical and much less messy jar filling guarenteed. 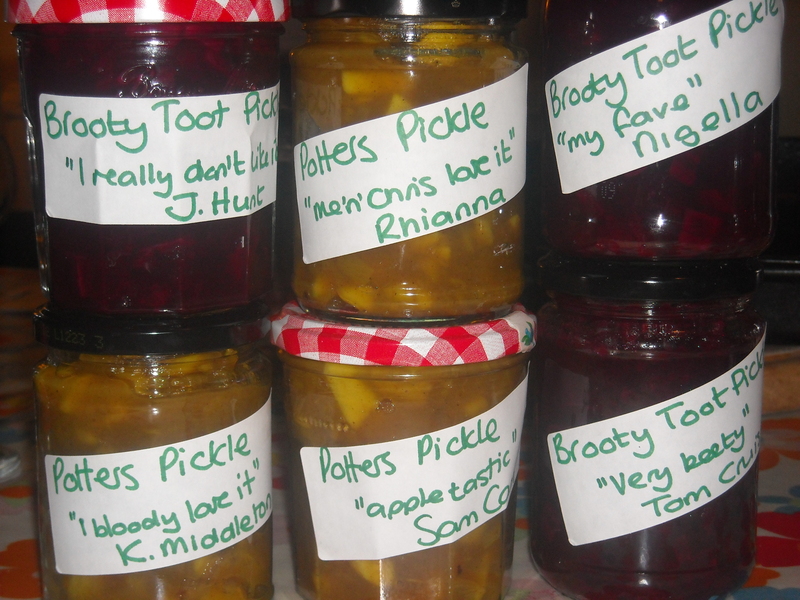 All in all the above made about 12 jars of Potters Pickle and 15 of Brooty Toot, plenty enough to share between the four of us and to give some to Helen and Sue who generously provided us with the apples and beetroot. THANK YOU, YOU TWO. We were starving after a good couple of hours of chop n chat so we ate some still-hot chutney with home made smoked mackerel pate (the easiest thing in the world to make – smoked mackerel, cream cheese, lemon juice, pepper) and some shop bought pate with prunes in (very nice) and some boring cheese, baguette and oat cakes. DELICIOUS SUPPER and a massive sense of achievement looking at our stack of chutney filled jars. Not bad for a Monday! We drank… well it was almost Mandy’s birthday so we had to have a fizzy and Gilly treated us to a bottle from a local vineyard, Greyfriars on the Hogs Back. The vineyard changed hands in 2010 and our bottle was from the previous owners time, very good, but the new owners are promising improvements so we’ll keep an eye out. Always nice to support local producers. We talked about… Christmas (sorry), Nigel Slater, Mandy’s upcoming party, apple shortages, English sparkling wines, gardening woe, Milton Jones, kitchen refurbs. This entry was posted in chutneys & pickles and tagged apples, beetroot, cheese, chillies, chutney, Farnham, food, mackerel, pickle, spicey. Bookmark the permalink.